Warrant by Treasurer Oxford to Spencer Compton to pay Daniel Arthur 800l. without account: in satisfaction of a bill of exchange drawn from Madrid 26 June last, new style, by Emanuel Manasses Gilligan for her Majesty's especial service. Money Book XXII, p. 279. Money order for 425l. 2s. 2d. to Charles Heneage, Chief Usher of the Exchequer Court, for necessaries by him furnished to the officers of said Court in Trinity term 1713, and a further 2l. 17s. 6d. for 138 days 1712–13 March 14 to 1713 July 30 on his diet of 2d. a day. Order Book VIII, p. 315. 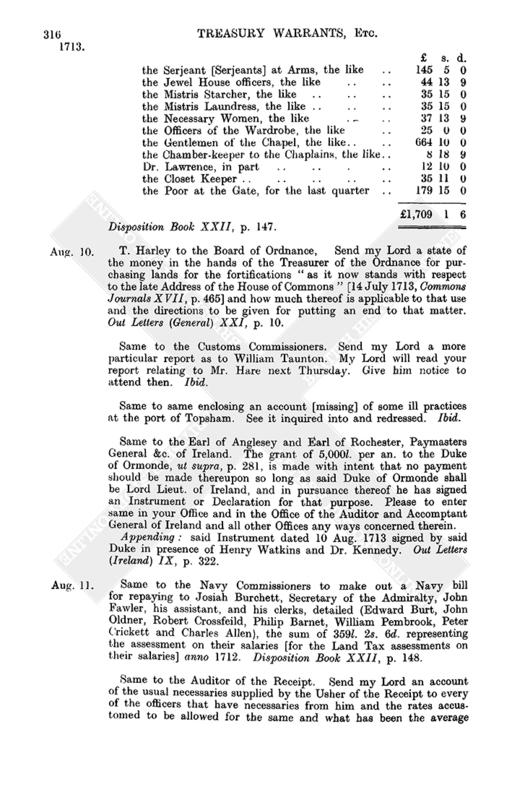 T. Harley to the Navy Commissioners to make out a Navy bill for paying to Sir Roger Mostyn, Paymaster of Marines, 3,171l. 17s. 3½d. as imprest towards discharging the non-commissioned Officers and private men of Col. Charles Churchill's and Col. Goring's Regiment [of Marines], which are ordered to be reduced: viz. The said sum is to be assigned for payment out of the 100,000l. lent by the Bank to the Navy Treasurer on Malt tallies anno 1713. Upon making forth this bill my Lord Treasurer desires that the bill for 24,423l. 12s. 6½d., ut supra, p. 277, be vacated, his Lordship having thought fit to put a stop to the payment of that sum. (Same of same date to the Navy Treasurer to pay the said 3,171l. 17s. 3½d. to Sir Roger Mostyn.) Disposition Book XXII, p. 144. Same to the Customs Commissioners to present William Powell (an extraordinary tidesman, London port) and John Wright for the first vacant tidesmen's places: they being recommended by Visct. Hereford and Mr. Cæsar respectively. Out Letters (General) XXI, p. 2. Same to same. My Lord Treasurer has not agreed to your proposed exchange between Charles Pembridge and George Lisle. You are to consider William Taunton (who has been instructed by the officers at Bristol) as searcher loco said Lisle. Ibid. Same to Mr. Finch. Send my Lord Treasurer an account what golden Collars of deceased Knights of the Garter have been returned to the Jewel Office since the Revolution; how many are standing out; and what method is used to bring them in; and how or by what warrants the same have been again delivered out or disposed of. Ibid. Aug. 1, 3, 6, 17. Treasury reference to the Customs Commissioners of the petition for release of the following ships from quarantine: viz. Skelton Castle, Iphigenia, David, Mary and Ann, Providence, Martha, Owner's Goodwill, Fox, Unity, Thomas and Jane, Union, Ann and Elizabeth, St. Martin: on the petition of Charles Brander (Aug.1). Jean: on the petition of Robert Forresdale (Aug.1). Union: on the petition of Peter Renew (Aug. 3). Eleanor: on the petition of John Cleveland (Aug. 6). Prosperous Ann, Sarah and Mary, Young St. Quintin, Crown, Happy Return, Roterdam, John, Unity, Vine, Nathaniel: on the petition of Richard Green (Aug. 17). Out Letters (Customs) XVI, p. 19. 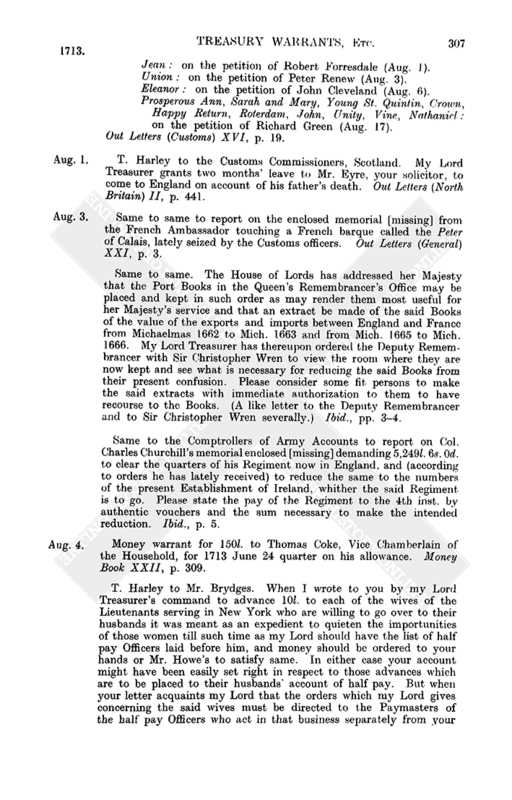 T. Harley to the Customs Commissioners, Scotland. My Lord Treasurer grants two months’ leave to Mr. Eyre, your solicitor, to come to England on account of his father's death. Out Letters (North Britain) II, p. 441. Same to same to report on the enclosed memorial [missing] from the French Ambassador touching a French barque called the Peter of Calais, lately seized by the Customs officers. Out Letters (General) XXI, p. 3. Same to same. The House of Lords has addressed her Majesty that the Port Books in the Queen's Remembrancer's Office may be placed and kept in such order as may render them most useful for her Majesty's service and that an extract be made of the said Books of the value of the exports and imports between England and France from Michaelmas 1662 to Mich. 1663 and from Mich. 1665 to Mich. 1666. My Lord Treasurer has thereupon ordered the Deputy Remembrancer with Sir Christopher Wren to view the room where they are now kept and see what is necessary for reducing the said Books from their present confusion. Please consider some fit persons to make the said extracts with immediate authorization to them to have recourse to the Books. (A like letter to the Deputy Remembrancer and to Sir Christopher Wren severally.) Ibid., pp. 3–4. Same to the Comptrollers of Army Accounts to report on Col. Charles Churchill's memorial enclosed [missing] demanding 5,249l. 6s. 0d. to clear the quarters of his Regiment now in England, and (according to orders he has lately received) to reduce the same to the numbers of the present Establishment of Ireland, whither the said Regiment is to go. Please state the pay of the Regiment to the 4th inst. by authentic vouchers and the sum necessary to make the intended reduction. Ibid., p. 5. Money warrant for 150l. to Thomas Coke, Vice Chamberlain of the Household, for 1713 June 24 quarter on his allowance. Money Book XXII, p. 309. T. Harley to Mr. Brydges. When I wrote to you by my Lord Treasurer's command to advance 10l. to each of the wives of the Lieutenants serving in New York who are willing to go over to their husbands it was meant as an expedient to quieten the importunities of those women till such time as my Lord should have the list of half pay Officers laid before him, and money should be ordered to your hands or Mr. Howe's to satisfy same. In either case your account might have been easily set right in respect to those advances which are to be placed to their husbands' account of half pay. But when your letter acquaints my Lord that the orders which my Lord gives concerning the said wives must be directed to the Paymasters of the half pay Officers who act in that business separately from your Office, “his Lordship is much surprised that such separate Paymasters should be made or appointed without his participation and as the Exchequer has no cognisance of any such separate Paymasters his Lordship (who is persuaded there is no need of severing this business from the Office of Paymaster General) will order the half pay to be issued to the hands of such General Paymaster, so as the public money granted for that service may be paid and accounted for in the course and method of the Exchequer as it ought to be.” Out Letters (General) XXI, p. 7. Letter of direction for 4,375l. to the Commissioners for Stating the Public Accounts: out of the 25l. per ton on French wines: 875l. thereof for last June 24 quarter's salary to the Commissioners, 2,500l. for incidents in their said Commission and 1,000l. for incidents in executing the Commission for stating and determining the debts of the Army. “This is to aid the Deficiency of the public funds of the year 1713.” Disposition Book XXII, p. 145. 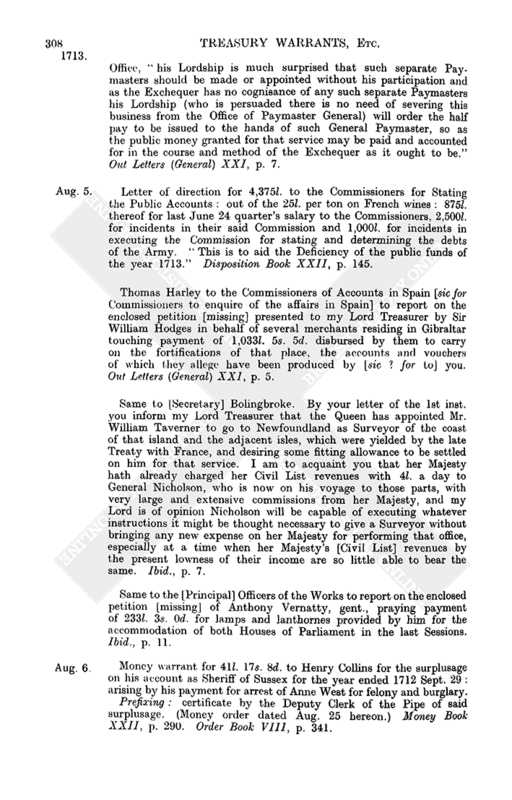 Thomas Harley to the Commissioners of Accounts in Spain [sic for Commissioners to enquire of the affairs in Spain] to report on the enclosed petition [missing] presented to my Lord Treasurer by Sir William Hodges in behalf of several merchants residing in Gibraltar touching payment of 1,033l. 5s. 5d. disbursed by them to carry on the fortifications of that place, the accounts and vouchers of which they allege have been produced by [sic? for to] you. Out Letters (General) XXI, p. 5. Same to [Secretary] Bolingbroke. By your letter of the 1st inst. you inform my Lord Treasurer that the Queen has appointed Mr. William Taverner to go to Newfoundland as Surveyor of the coast of that island and the adjacent isles, which were yielded by the late Treaty with France, and desiring some fitting allowance to be settled on him for that service. I am to acquaint you that her Majesty hath already charged her Civil List revenues with 4l. a day to General Nicholson, who is now on his voyage to those parts, with very large and extensive commissions from her Majesty, and my Lord is of opinion Nicholson will be capable of executing whatever instructions it might be thought necessary to give a Surveyor without bringing any new expense on her Majesty for performing that office, especially at a time when her Majesty's [Civil List] revenues by the present lowness of their income are so little able to bear the same. Ibid., p. 7. Same to the [Principal] Officers of the Works to report on the enclosed petition [missing] of Anthony Vernatty, gent., praying payment of 233l. 3s. 0d. for lamps and lanthornes provided by him for the accommodation of both Houses of Parliament in the last Sessions. Ibid., p. 11. Money warrant for 41l. 17s. 8d. to Henry Collins for the surplusage on his account as Sheriff of Sussex for the year ended 1712 Sept. 29: arising by his payment for arrest of Anne West for felony and burglary. Prefixing: certificate by the Deputy Clerk of the Pipe of said surplusage. (Money order dated Aug. 25 hereon.) Money Book XXII, p. 290. Order Book VIII, p. 341. Prefixing: report by the Excise Commissioners thereon. Money Book XXII, pp. 292–3. Money warrant for 700l. to William Borret: as imprest for Crown Law suit charges. (Money order dated Aug. 7 hereon.) Ibid., p. 293. Order Book VIII, p. 321. Same for 800l. to Robert, Lord Lexinton, Ambassador Extraordinary to Spain: for two bills of extraordinaries in that service 1712 Dec. 11 to 1713 May 11. (1) from 11 Nov. 1712 to 11 Feb. following. (2) from 11 Feb 1712–13 to 11 May 1713. (Money order dated Aug.11 hereon.) Money Book XXII, p. 293. Order Book VIII, p. 322. Same for 30l. to the underkeepers of Cranburne Chase for 1½ years to June 24 last on their allowance of 20l. per an. for providing hay for the deer within the said Chase. (Money order dated Aug. 20 hereon.) Money Book XXII, p. 294. Order Book VIII, p. 323. 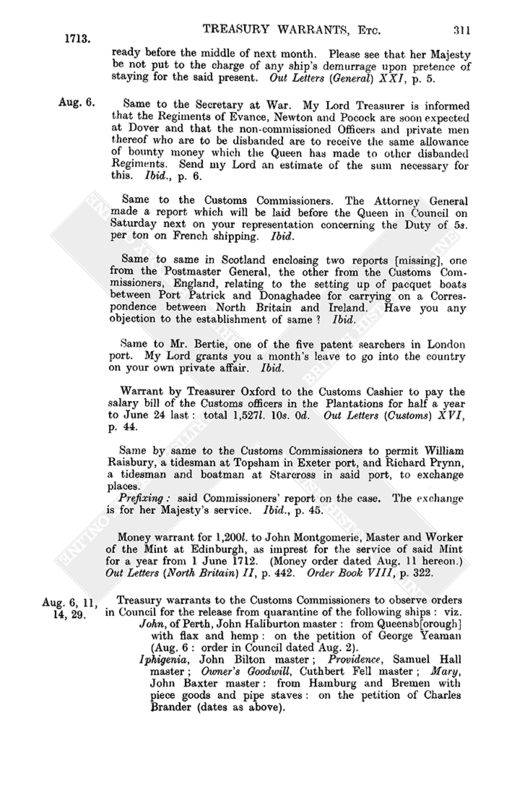 Warrant by Treasurer Oxford to the Customs Cashier to pay 80l. 12s. 4d. to the Officers of the Pipe, viz. 63l. 2s. 0d. to the Clerk of the Pipe and the Secondary and sworn clerks; 5l. 15s. 0d. to John Pottenger, Comptroller of the Pipe; 11l. 15s. 4d. to John Smith and George Leslie, Deputy Chamberlains for joining tallies: for one year due at Midsummer 1713 on their several fees payable out of the revenue of the Customs. Money Book XXII, p. 294. Money warrant for 40l. to Joseph Cranmer and Cha. Milburne, the two Secondaries in the Office of the Pipe, for two years to 1711 Xmas on their respective salaries of 10l. per an. each. Money Book XXII, p. 294. Same for 391l. 13s. 4d. to Malachy Thurston, Knight Harbinger to her Majesty, for same time on his fee of 20 marks per an. and 10s. a day. Ibid. Same for 835l. 7s. 6d. to Sir John Cass and Sir William Stewart for the surplusage on their account as late Sheriffs of London and Middlesex for the year ended 1712 Sept. 29; the same arising by payments to William Gardner, Benjamin Masters, Richard Ford and William Richardson for apprehending and convicting Thomas Jarret and seven others, burglars, and William Maw, Thomas Prichet, Andrew Baynes and John Sutton for robbery on the highway. Prefixing: certificate by the Deputy Clerk of the Pipe of said surplusage. (Money order dated Aug. 20 hereon.) Ibid., p. 297. Order Book VIII, p. 324. Same for 97l. 6s. 8d. to Michael Studholme, Keeper of her Majesty's Roads and Guide of her Person in her Progresses &c.; 36l. 10s. 0d. thereof for one year to 1712 Xmas on his patent fee of 2s. a day and 60l. 16s. 8d. for same time on his allowance of 3s. 4d. a day for travelling charges. (Money order dated Aug. 20 for 60l. 16s. 8d. hereon for the latter item.) Money Book XXII, p. 298. Order Book VIII, p. 327. Same for 34l. 15s. 1d. to John Coxe for the surplusage on his account as Sheriff of Co. Wilts for the year ended 1711 Sept. 29 arising by his payments to Joseph Lewis et al. for apprehending Joseph Rice for felony. Prefixing: certificate by the Deputy Clerk of the Pipe of the said surplusage. (Money order dated Nov. 6 hereon.) Money Book XXII, p. 299. Order Book VIII, p. 366. Same for 49l. 11s. 8½d. to Charles Holt for a like surplusage as late Sheriff of Co. Oxford for the year ended 1712 Sept. 29 arising by his payments to Bartholomew Paxton et al. for apprehending Richard Miller and Peter Jackson for robbery on the highway. Prefixing: ut supra. (Money order dated Nov. 26 hereon.) Money Book XXII, p. 300. Order Book VIII, p. 360. Warrant by Treasurer Oxford to the Auditor of the Receipt to issue to Charles Cæsar, Treasurer of the Navy, 261,639l. 15s. 0d. out of the Exchequer Bills to be made forth in pursuance of the Act of last Session, 12 Anne, c. 11, for circulating 1,200,000l. Exchequer Bills anno 1713: and is to be as imprest (together with 25,000l. already imprested to him for this purpose) to be paid over by him to Robert Knight, Cashier to the South Sea Company, to complete their half year's interest and allowance to June 24 last. Disposition Book XXII, p.146. T. Harley to Secretary Dartmouth enclosing Mr. Baker's reply [missing] touching the present designed by her Majesty for the Emperor of Morocco and his two Alcaids. The whole cannot be gotten ready before the middle of next month. Please see that her Majesty be not put to the charge of any ship's demurrage upon pretence of staying for the said present. Out Letters (General) XXI, p. 5. Same to the Secretary at War. My Lord Treasurer is informed that the Regiments of Evance, Newton and Pocock are soon expected at Dover and that the non-commissioned Officers and private men thereof who are to be disbanded are to receive the same allowance of bounty money which the Queen has made to other disbanded Regiments. Send my Lord an estimate of the sum necessary for this. Ibid., p. 6. Same to the Customs Commissioners. The Attorney General made a report which will be laid before the Queen in Council on Saturday next on your representation concerning the Duty of 5s. per ton on French shipping. Ibid. Same to same in Scotland enclosing two reports [missing], one from the Postmaster General, the other from the Customs Commissioners, England, relating to the setting up of pacquet boats between Port Patrick and Donaghadee for carrying on a Correspondence between North Britain and Ireland. Have you any objection to the establishment of same? Ibid. Same to Mr. Bertie, one of the five patent searchers in London port. My Lord grants you a month's leave to go into the country on your own private affair. Ibid. 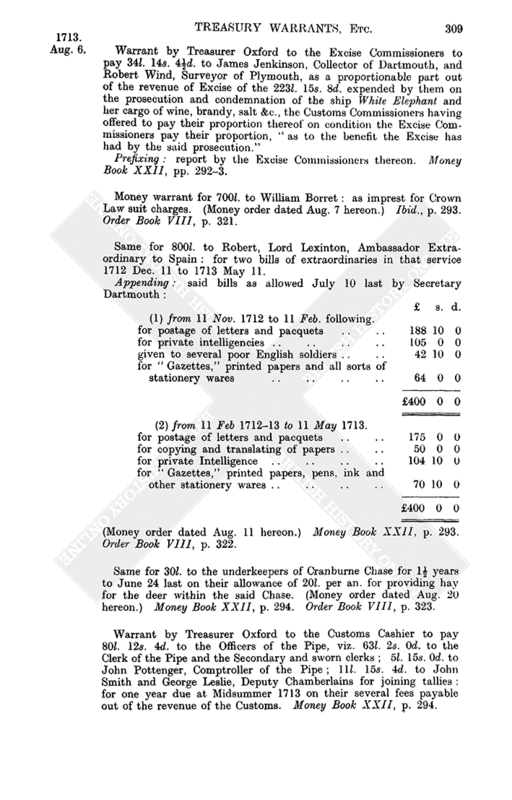 Warrant by Treasurer Oxford to the Customs Cashier to pay the salary bill of the Customs officers in the Plantations for half a year to June 24 last: total 1,527l. 10s. 0d. Out Letters (General) XVI, p. 44. Same by same to the Customs Commissioners to permit William Raisbury, a tidesman at Topsham in Exeter port, and Richard Prynn, a tidesman and boatman at Starcross in said port, to exchange places. Prefixing: said Commissioners’ report on the case. The exchange is for her Majesty's service. Ibid., p. 45. Money warrant for 1,200l. to John Montgomerie, Master and Worker of the Mint at Edinburgh, as imprest for the service of said Mint for a year from 1 June 1712. (Money order dated Aug. 11 hereon.) Out Letters (North Britain) II, p. 442. Order Book VIII, p. 322. Treasury warrants to the Customs Commissioners to observe orders in Council for the release from quarantine of the following ships: viz. John, of Perth, John Haliburton master: from Queensb[orough] with flax and hemp: on the petition of George Yeaman (Aug. 6: order in Council dated Aug. 2). Iphigenia, John Bilton master; Providence, Samuel Hall master; Owner's Goodwill, Cuthbert Fell master; Mary, John Baxter master: from Hamburg and Bremen with piece goods and pipe staves: on the petition of Charles Brander (dates as above). Greyhound galley, Alexander Salkirk master: with sundry goods for [sic? from] Hamburg: on the petition of Andrew Endrupe (Aug. 6: order in Council dated July 30). William and Robert, Robert Grundy master: from Konigsberg with iron: on the petition of Richard Green (Aug. 11: order in Council dated Aug. 8). Skelton Castle, Isaac Newton master; Martha Ann, Simon Richardson master: from Hamburg with bale goods; on the petition of Charles Brander (Aug. 14: order in Council dated Aug. 8). Elianor, Richard Molineux master: from Gottenberg with iron, pitch &c.: on the petition of John Cleeveland (Aug. 29: order in Council dated Aug. 23). Unity, John Evers master; Thomas and Jane, John Reed master; Mary and Anne, Michael Burn master: from Gottenberg with iron, deals &c.: on the petition of Charles Brander (dates as above). Anne, of London; Elizabeth: from Stockholm with iron &c.: on the petition of Sir Ambrose Crowley (dates as above). Out Letters (Customs) XVI, pp. 45, 53. Warrant by Treasurer Oxford to Spencer Compton to pay 600l. to Daniel Arthur: without account: in satisfaction of a bill of exchange drawn from Paris July 20 last, new style, by Matthew Prior for her Majesty's especial service. Money Book XXII, p. 291. Same to same to pay 180l. to said Arthur for a bill of exchange drawn from Madrid July 17 last, new style, by Emanuel Manasses Gilligan for her Majesty's especial service. Ibid. Money order for 37l. 10s. 0d. to Thomas Topham for 1713 June 24 quarter's allowance as Supervisor of the digesting the Records in Cæsar's Chapel in the Tower; to wit for himself and three clerks. 25l. to Geo. Holmes for same quarter as chief clerk in said work. Order Book VIII, pp. 322, 321. Royal warrant dated Windsor Castle to Edward Nicholas as successor to Spencer Compton in the office of Paymaster of the Queen's [private] bounties and pensions, to take to his own use 400l. per an. as salary out of the moneys imprested to him for such pensions and bounties: to date as from June 24 last: during pleasure. Queen's Warrant Book XXV, p. 440. Warrant by Treasurer Oxford to Spencer Compton to pay 50l. to the Countess Dowager of Dalhousie: as royal bounty. Money Book XXII, p. 291. T. Harley to the Treasurer of the Navy to apply to the following uses the 42,097l. 7s. 8½d., which is the undisposed residue of the 100,000l. advanced to you by the Bank of England on Malt anno 1713: viz. on the head of Wages. on the head of Wear and Tear. (Same dated same to the Navy Commissioners to make forth a Navy bill for the abovesaid 4,786l. 19s. 6d.) Disposition Book XXII, p. 146. Letter of direction for 1,500l. to John Holbech: for the service of the Office of Treasurer of the Chamber: out of Civil List moneys: to be applied to such services of the said Office as my Lord shall direct. Ibid., p. 147. T. Harley to the Attorney General to report on the enclosed petition [missing] of the Bailiff and Warden of the Weavers Company, London, relating to several Acts of Parliament concerning the manufacture of Alamodes and Lustrings. Out Letters (General) XXI, p. 8. 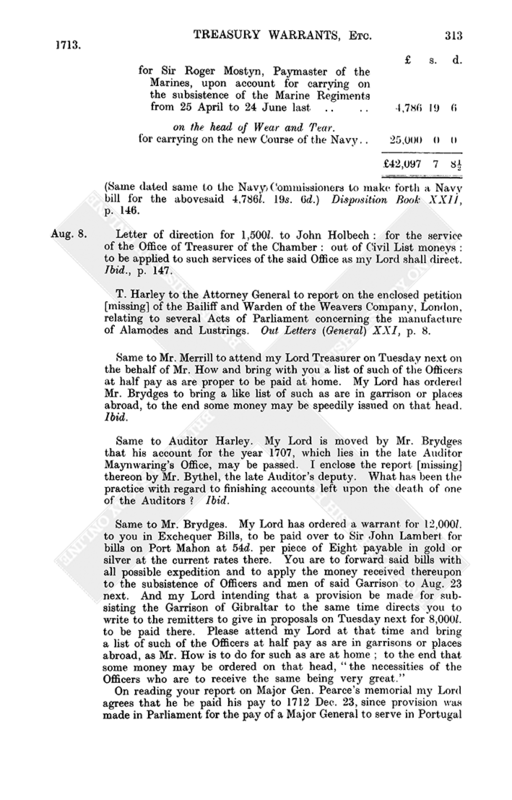 Same to Mr. Merrill to attend my Lord Treasurer on Tuesday next on the behalf of Mr. How and bring with you a list of such of the Officers at half pay as are proper to be paid at home. My Lord has ordered Mr. Brydges to bring a like list of such as are in garrison or places abroad, to the end some money may be speedily issued on that head. Ibid. Same to Auditor Harley. My Lord is moved by Mr. Brydges that his account for the year 1707, which lies in the late Auditor Maynwaring's Office, may be passed. I enclose the report [missing] thereon by Mr. Bythel, the late Auditor's deputy. What has been the practice with regard to finishing accounts left upon the death of one of the Auditors? Ibid. On reading your report on Major Gen. Pearce's memorial my Lord agrees that he be paid his pay to 1712 Dec. 23, since provision was made in Parliament for the pay of a Major General to serve in Portugal to that time. Please report on the enclosed memorial [missing] of Lord Mark Kerr and the Officers of his Regiment for arrears of subsistence. How do they ground their pretensions, because great sums have been paid for subsisting the Forces from Feb. 23 last, whereas they allege no subsistence has been paid them since that date? Out Letters (General) XXI, p. 9. T. Harley to Mr. Borret. What proceedings are made about Col. Park's affair and what may be expected from the evidence of French and Oglethorpe, who pray a settled weekly allowance as witnesses forced to come here? Ibid., p. 10. Same to the Commissioners for Army Accounts enclosing for their perusal Mr. Brydges' memorial [missing] for 29,391l. 0s. 9d. for the extraordinary charges of forage for the several Regiments of Dragoons in her Majesty's pay which served in Portugal, [to wit] from 23 Dec. 1710 to the several days of their disbandment. Ibid. Warrant by Treasurer Oxford to Sir William Wyndham, Secretary at War, to prepare a royal warrant to authorise John Howe, Paymaster of Guards and Garrisons, to pay 442l. 2s. 0d. to Edward, Earl of Clarendon, in lieu of respits on the Independent Company at New York between 8 May 1702 and 24 June 1708, when the said Company was under his command as Governor of New York. Prefixing: report by the Comptrollers of Army Accounts, dated Comptrollers' Office, Privy Garden, May 14, on said Earl's petition for same to be allowed him in consideration of the many hardships he suffered in the said government. The accounts of the said Company are still open and he was at very great expense on account of it, which none of the other Companies upon the same Establishment were subject to. He provided the men with watch gowns and other necessaries at his own charge, and the Company being always clothed in England he had no opportunity of reimbursement [out of deductions] and he was at the whole charge of transporting his men from Albany to [New] York, which was an expense that did not fall upon [the three] other Companies. Warrants not Relating to Money XXII, pp. 99–100. to the Master Forrester for his own fee, 100s. to the Under Forrester of Norton Woods and Sholebrook Lawn, being a double walk, 44 last of wood and 3l. 6s. 8d. in money yearly. to the Page Keeper of said Woods, 11 load of wood and 16s. 8d. in money yearly. to the Under Forrester of the Walk called Shrob Office, 22 load of wood and 33s. 4d. in money yearly. to the Page Keeper of the same Walk, 11 load of wood and 16s. 8d. in money yearly. to the Under Forrester of the Walk called Hanger Office, 22 load of wood and 33s. 4d. in money yearly. to the Under Forrester of Haslebrough Office, 22 load of wood and 33s. 4d. in money yearly. to the Page Keeper of Haslebrough Office, 11 load of wood and 16s. 8d. in money yearly. to the Under Forrester of the double Walk called Wakefeild and Legullett Office, 44 load of wood and 3l. 6s. 8d. in money yearly. to the Deputy Master Forrester, 33 load of wood and for his expenses in making hay for the deer 3l. 6s. 8d. in money yearly. And in the said patent the said claims are declared absolutely to be abolished in all times coming, but that the said officers and ministers should receive in lieu thereof an allowance in money after the rate of 10s. for every load of wood, being in all 115l. 10s. 0d. for 231 load. It is therefore hereby ordered that every year the Surveyor General of Woods, Trent South, should mark and fell sufficient dotard timber in said Forest to raise the abovesaid fees of (in all) 23l. 6s. 8d. and the abovesaid allowance of 115l. 10s. 0d. in lieu of claims; and thereupon to pay said sums to the said respective officers and ministers in the shares as above. In the margin: a later confirmation dated 1715 April 12 of the Treasury Lords thereof. Ibid., pp. 100–2. Same by same to Spencer Compton to pay 100l. to James Greensheilds, clerk, as royal bounty. Money Book XXII, p. 297. Money warrant for 420l. 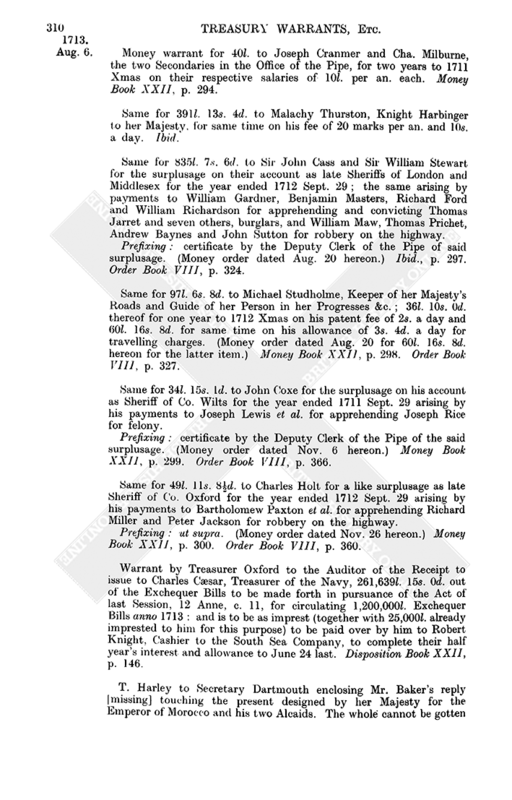 to John Conyers for 10½ years to 1712 Xmas on his fee of 40l. per an. as one of her Majesty's Counsellors at Law. Ibid., p. 317. T. Harley to John Holbech to pay as follows out of the 1,998l. now remaining in your hands for the service of the Office of the Treasurer of the Chamber: viz. Disposition Book XXII, p. 147. T. Harley to the Board of Ordnance, Send my Lord a state of the money in the hands of the Treasurer of the Ordnance for purchasing lands for the fortifications “as it now stands with respect to the late Address of the House of Commons ” [14 July 1713, Commons Journals XVII, p. 465] and how much thereof is applicable to that use and the directions to be given for putting an end to that matter. Out Letters (General) XXI, p. 10. Same to the Customs Commissioners. Send my Lord a more particular report as to William Taunton. My Lord will read your report relating to Mr. Hare next Thursday. Give him notice to attend then. Ibid. Same to same enclosing an account [missing] of some ill practices at the port of Topsham. See it inquired into and redressed. Ibid. Same to the Earl of Anglesey and Earl of Rochester, Paymasters General &c. of Ireland. The grant of 5,000l. per an. to the Duke of Ormonde, ut supra, p. 281, is made with intent that no payment should be made thereupon so long as said Duke of Ormonde shall be Lord Lieut. of Ireland, and in pursuance thereof he has signed an Instrument or Declaration for that purpose. Please to enter same in your Office and in the Office of the Auditor and Accomptant General of Ireland and all other Offices any ways concerned therein. Appending: said Instrument dated 10 Aug. 1713 signed by said Duke in presence of Henry Watkins and Dr. Kennedy. Out Letters (Ireland) IX, p. 322. Same to the Navy Commissioners to make out a Navy bill for repaying to Josiah Burchett, Secretary of the Admiralty, John Fawler, his assistant, and his clerks, detailed (Edward Burt, John Oldner, Robert Crossfeild, Philip Barnet, William Pembrook, Peter Crickett and Charles Allen), the sum of 359l. 2s. 6d. representing the assessment on their salaries [for the Land Tax assessments on their salaries] anno 1712. Disposition Book XXII, p. 148. Same to the Auditor of the Receipt. 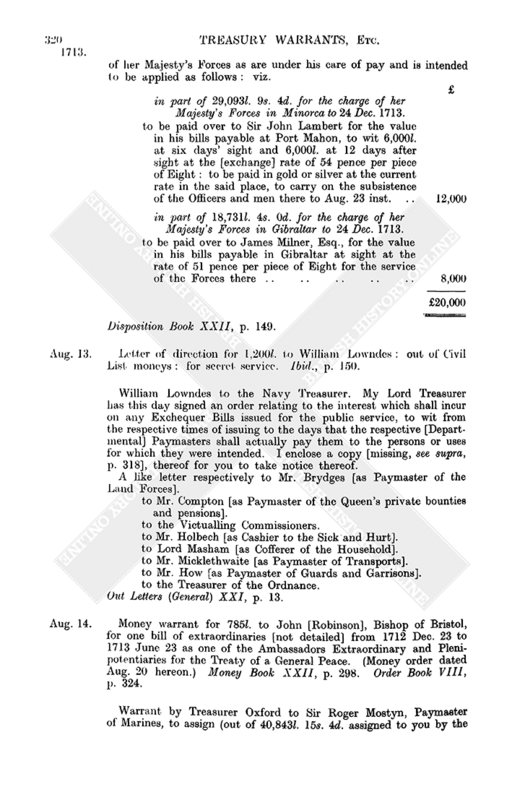 Send my Lord an account of the usual necessaries supplied by the Usher of the Receipt to every of the officers that have necessaries from him and the rates accustomed to be allowed for the same and what has been the average of such expense for every Office [in the Exchequer] by a medium of three or more years past. Out Letters (General) XXI, p. 11. Same to Mr. Strickland. Send my Lord your answer in writing to the enclosed account [missing] of some misdemeanours committed in the Transfer Office of which you are master. Ibid., p. 12. Same to the Commissioners of Trade. Some of the disbanded Officers and soldiers who propose the making of a settlement in North America have been before my Lord Treasurer and offered to go and settle there in case they be paid a year's pay according to the station they acted in when disbanded. Please report your opinion to my Lord on this proposition. I return your former report thereon with the papers accompanying it [missing]. Ibid. Same to Mr. Brydges to report on the [Army] clothiers’ petition desiring payment of the other moiety of the offreckonings due to them at Xmas last; to wit out of tallies remaining in your hands. Please consider their case with respect to the Attorney General's opinion upon an Act passed in the 11th year of her Majesty's reign [12 Anne, c. 3] which required the Commissioners of Accounts to examine all unadjusted accounts of money due for clothing. Ibid. Same to Sidney Strode et al. 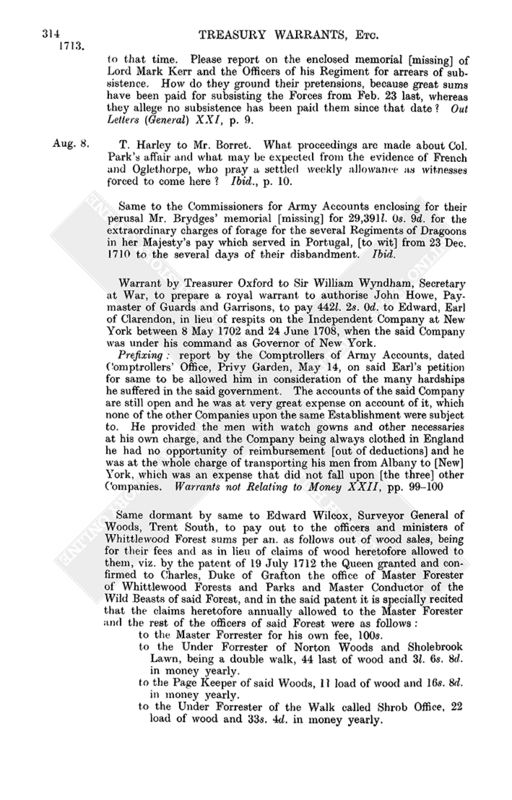 enclosing the Victualling Commissioners’ report [missing] concerning the lands called Lam-hay at Plymouth employed in the service of the Victualling “to which you as legatees of Sir William Strode lay claim.” Please inform my Lord why the prosecution on the ejectment in 1707 was discontinued. Ibid., p. 21. 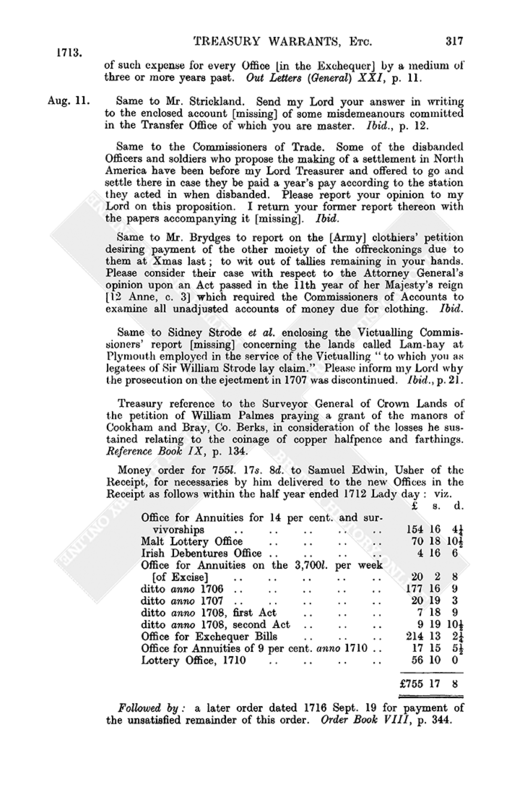 Treasury reference to the Surveyor General of Crown Lands of the petition of William Palmes praying a grant of the manors of Cookham and Bray, Co. Berks, in consideration of the losses he sustained relating to the coinage of copper halfpence and farthings. Reference Book IX, p. 134. Money order for 755l. 17s. 8d. to Samuel Edwin, Usher of the Receipt, for necessaries by him delivered to the new Offices in the Receipt as follows within the half year ended 1712 Lady day: viz. Followed by: a later order dated 1716 Sept. 19 for payment of the unsatisfied remainder of this order. Order Book VIII, p. 344. Money order for 762l. 8s. 6¾d. to Samuel Edwin, Usher of the Receipt, for necessaries by him delivered to the new Offices in the Receipt for the half year to 1711 Sept. 29, the Offices being the same as above, p. 317, but the amounts varying in detail. Followed by: a like later order of 1716 Sept. 19 as above. Order Book VIII, p. 345. Same for 974l. 6s. 2¼d. to same for necessaries by him delivered to the officers of the Receipt in Easter and Trinity terms anno 1711. 1,991l. 13s. 0¾d. for the like delivered in Michaelmas and Hilary terms anno 1711. Ibid., p. 391. J. Taylour (in the absence of the Treasury Secretaries) to Mr. Brydges. Bring my Lord to-morrow an account of the salaries and allowances of the several Deputy Paymasters and Agents under you in foreign parts and the number of Troops under their respective pays: also of the salaries of Commissaries of Stores, Musters and such like. Out Letters (General) XXI, p. 11. Royal letters patent constituting Thomas Foley of Stoke Court, Co. Hereford, to be one of the Auditors of Imprests with the annual fee of 100 marks: to hold during good behaviour and as amply as Arthur Maynwaring or any other predecessor therein. Queen's Warrant Book XXIII, pp. 177–9. Order and direction by Treasurer Oxford that the respective [Departmental] Paymasters when they pay away any Exchequer Bills in their hands (issued to them for public services) shall take care that the interest then due [accrued] on each Bill shall be reckoned with the principal towards making the payment: and further that when they receive Exchequer Bills to be applied to the satisfaction of bills of exchange accepted but not due, they do take care that the interest incurred [accured] on such Exchequer Bills at the time of such application thereof (or that shall grow due thereon till the due date of the bill of exchange whereto the same shall be applied) shall be reckoned and go in payment towards the satisfaction of such bill of exchange: and the said respective Paymasters are voluntarily to charge themselves on oath with such interest. Money Book XXII, p. 301. Warrant by same to the South Sea Company to permit Charles Cæsar, Treasurer of the Navy, to transfer 3,134l. 13s. 3¼d. of South Sea Stock (out of the 1,421,274l. 14s. 4d. subscribed by him into said Stock in the name of the public) to Francis Lynn, Treasurer for Sick and Wounded, by way of imprest and upon account, being 6 per cent. interest on 69,659l. 3s. 10¼d., which was the debt in the Office for Sick and Wounded on the 25 March 1711, to wit [the interest due] from the 25th March 1711 to the 25 Dec. following; which said principal sum has already been transferred by said Cæsar to the late Treasurer for Sick and Wounded without such interest. Ibid., p. 302. Same by same to Charles Turnour, Register and Comptroller of Class Lottery 1712, and to John Morley, Paymaster thereof, to pay and apply 2,387l. 12s. 4d. to discharge so much of the principal on the orders first in Course on said Lottery (thereby reducing the said principal from 2,341,740l. to 2,339,352l. 7s. 8d.) and further to pay and apply the sum of 75,997l. 11s. 5½d. together with such further sum as shall be requisite to complete nine months’ interest at Midsummer 1713 on the principal money or sum, to wit 2,339,352l. 7s. 8d. as above remaining on the said Lottery at that date. Money warrant for 256l. 16s. 2½d. to Lieut. 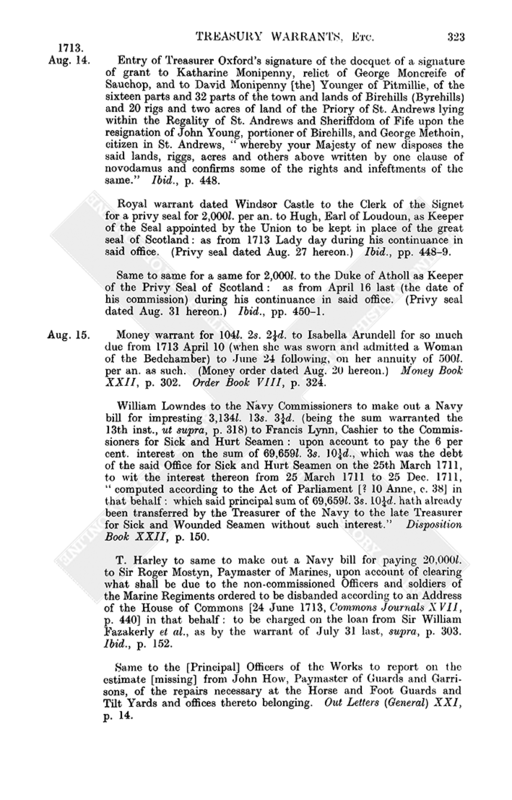 Gen. John Richmond Webb, Governor of the Isle of Wight and Receiver General of her Majesty's Revenue in the said island, as in satisfaction of the surplusage on his account of receipts and payments there for one year ended 1712 Sept. 29. Ibid., p. 307. Warrant by Treasurer Oxford to Spencer Compton to pay 100l. to Cross Martin, merchant, without account, as a present from her Majesty to the Archbishop of Thebes to carry him home. Ibid., p. 308. Same by same to Craven Payton, Warden of the Mint (“Warden of her Majesty's Exchange and Coinage of Money within the Tower of London”), to pay 91l. 19s. 3d. to William Wickham for so much disbursed by him for the diet and entertainment of the officers of the Mint and jurymen and others who attended the Trial of the Pix on Aug. 7 inst. Ibid., p. 310. Letter of direction signed by Treasurer Oxford for 20,000l. in Exchequer Bills to James Brydges: out of the Exchequer Bills to be made forth under the Act of last Session [12 Anne, c. 11], for 1,200,000l. Exchequer Bills anno 1713: and is for the service of such of her Majesty's Forces as are under his care of pay and is intended to be applied as follows: viz. in part of 29,093l. 9s. 4d. for the charge of her Majesty's Forces in Minorca to 24 Dec. 1713.
in part of18,731l. 4s. Od. for the charge of her Majesty's Forces in Gibraltar to24 Dec. 1713. Disposition Book XXII, p. 149. Letter of direction for 1,200l. to William Lowndes: out of Civil List moneys: for secret service. Ibid., p. 150. William Lowndes to the Navy Treasurer. 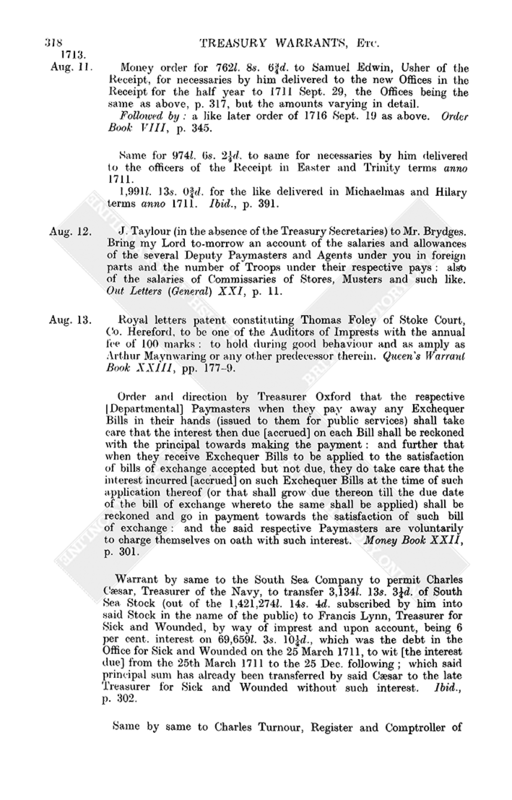 My Lord Treasurer has this day signed an order relating to the interest which shall incur on any Exchequer Bills issued for the public service, to wit from the respective times of issuing to the days that the respective [Departmental] Paymasters shall actually pay them to the persons or uses for which they were intended. I enclose a copy [missing, see supra, p. 318], thereof for you to take notice thereof. A like letter respectively to Mr. Brydges [as Paymaster of the Land Forces]. to Mr. Compton [as Paymaster of the Queen's private bounties and pensions]. to Mr. Holbech [as Cashier to the Sick and Hurt]. to Lord Masham [as Cofferer of the Household]. to Mr. Micklethwaite [as Paymaster of Transports]. to Mr. How [as Paymaster of Guards and Garrisons]. to the Treasurer of the Ordnance. Out Letters (General) XXI, p. 13. Money warrant for 785l. to John [Robinson], Bishop of Bristol, for one bill of extraordinaries [not detailed] from 1712 Dec. 23 to 1713 June 23 as one of the Ambassadors Extraordinary and Plenipotentiaries for the Treaty of a General Peace. (Money order dated Aug. 20 hereon.) Money Book XXII, p. 298. Order Book VIII, p. 324. 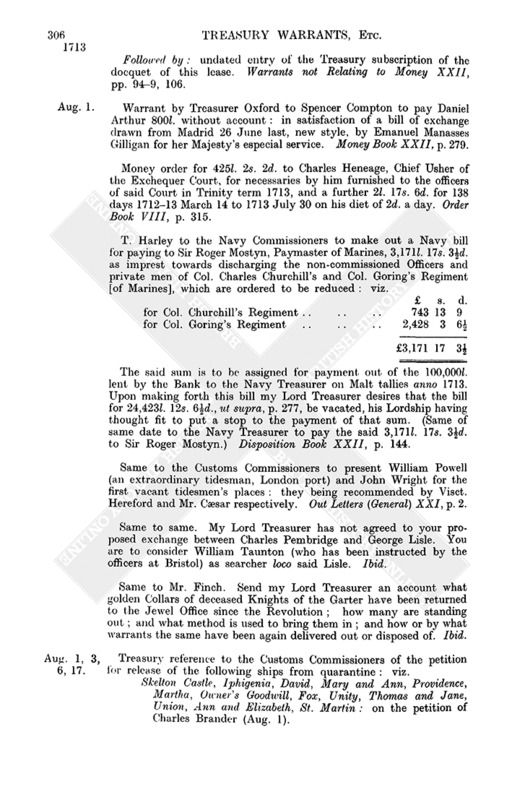 Warrant by Treasurer Oxford to Sir Roger Mostyn, Paymaster of Marines, to assign (out of 40,843l. 15s. 4d. assigned to you by the warrant of April 8 last, supra, p. 176) the sum of 16,799l. 13s. 7d. to the persons as follows for the offreckonings to 24 April 1711, due to them as clothiers of the several and respective Regiments named. James Colebrooke, General Holt's Regiment: total for the Regiment 6,807l. 5s. 10½d. : sum now to be paid 6,807l. 5s. 10½d. Mr. Le Bas, Brigadier Bor's Regiment: total for the Regiment 6,807l. 5s. 10½d. : sum now to be paid 3,714l. 0s. 4½d. 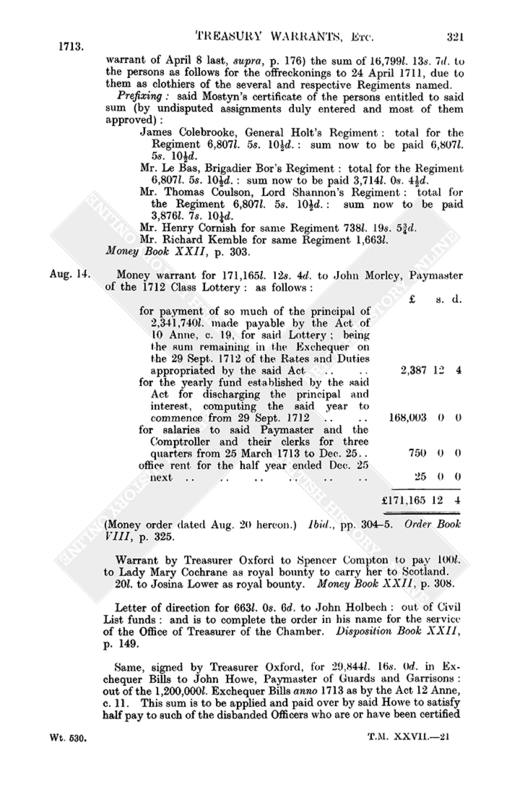 Mr. Thomas Coulson, Lord Shannon's Regiment: total for the Regiment 6,807l. 5s. 10½d. : sum now to be paid 3,876l. 7s. 10¼d. Mr. Henry Cornish for same Regiment 738l. 19s. 5¾d. Mr. Richard Kemble for same Regiment 1,663l. Money Book XXII, p. 303. (Money order dated Aug. 20 hereon.) Ibid., pp. 304–5. Order Book VIII, p. 325. Warrant by Treasurer Oxford to Spencer Compton to pay 100l. to Lady Mary Cochrane as royal bounty to carry her to Scotland. 20l. to Josina Lower as royal bounty. Money Book XXII, p. 308. Letter of direction for 663l. 0s. 6d. to John Holbech: out of Civil List funds: and is to complete the order in his name for the service of the Office of Treasurer of the Chamber. Disposition Book XXII, p. 149. Same, signed by Treasurer Oxford, for 29,844l. 16s. 0d. 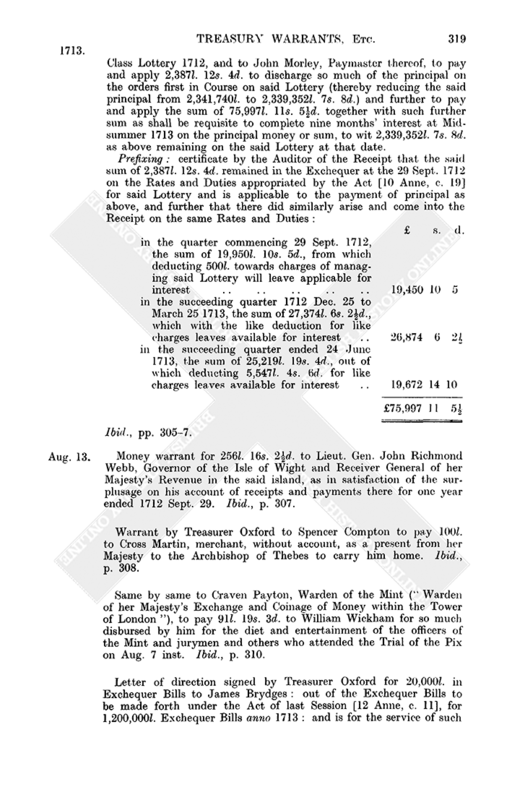 in Exchequer Bills to John Howe, Paymaster of Guards and Garrisons: out of the 1,200,000l. Exchequer Bills anno 1713 as by the Act 12 Anne, c. 11. This sum is to be applied and paid over by said Howe to satisfy half pay to such of the disbanded Officers who are or have been certified by the Secretary at War as duly qualified to receive the same, for 184 days from 1712 Dec. 25 to 1713 June 24: and is to be taken as in part of 99,028l. 6s. 11d. towards defraying the charge of half pay to the Land Forces’ Officers disbanded or to be disbanded to the 25 Dec. 1713. Disposition Book XXII, p. 151. T. Harley to the Auditors of Imprests to report on the enclosed memorial [missing] of the Commissioners for the 1711 Lottery [9 Anne, c. 6] stating an account in respect of the tickets and orders of the said Lottery and proposing the passing the same in the Exchequer. As the matter of such an account is wholly new will it be for the service of the public for my Lord to direct such passing of the account? Out Letters (General) XXI, p. 13. William Lowndes to the Postmasters General to report on the enclosed information [missing] against John Reynolls, who is applying to be a Deputy Postmaster at Chester. Ibid. Same to the Attorney General to advise as to a prosecution to be raised against the said Reynolls. Ibid. Warrant by Treasurer Oxford to the Queen's Remembrancer to deliver to Christopher Tilson and the executors of Charles Twitty their bonds as sureties for Sir John Humble as Paymaster of the Million Lottery [5–6 Wm. and Mary, c. 7], the remaining sureties being sufficient to answer the 1,354l. 3s. 11¼d. balance in the said Paymaster's hands. Prefixing: report by Hen. Stevens, the Deputy Queen's Remembrancer, as to the sufficiency of the said remaining sureties. Warrants not Relating to Money XXII, p. 105. 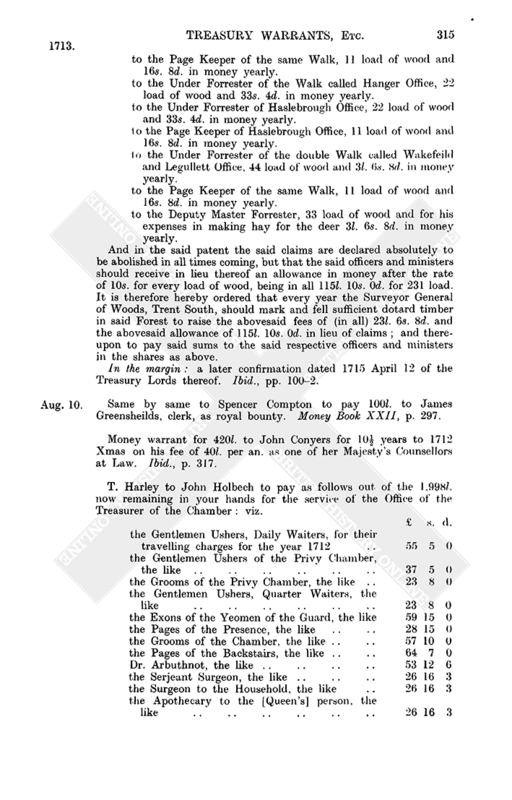 Subscription by same for the execution of a Lord Chamberlain's warrant to the Master of the Great Wardrobe for the delivery to Henry Pulleyn, Governor of Bermudas, of furniture [not detailed] for her Majesty's chapel there: to an estimate of 133l. Ibid., p. 25. 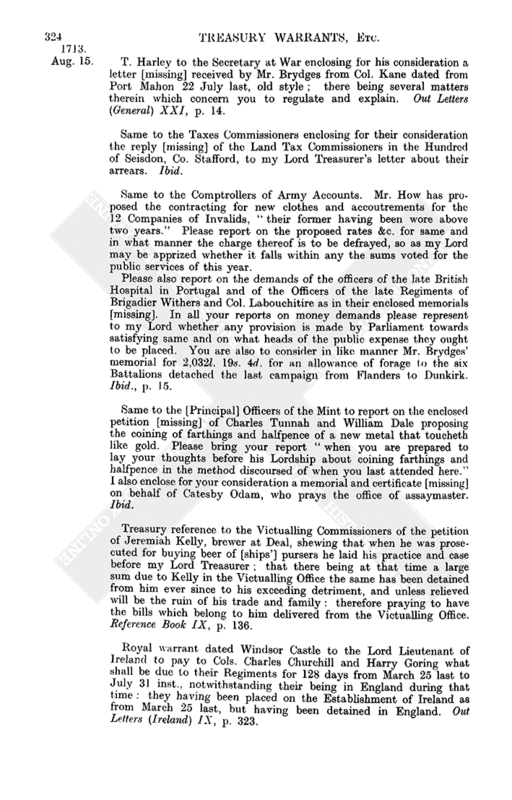 Royal warrant dated Windsor Castle to the Lord Lieutenant of Ireland to pay an annuity or pension of 100l. per an. to Samuel Hinton, junr., as from 1713 June 24 during pleasure. Out Letters (Ireland) IX, p. 324. 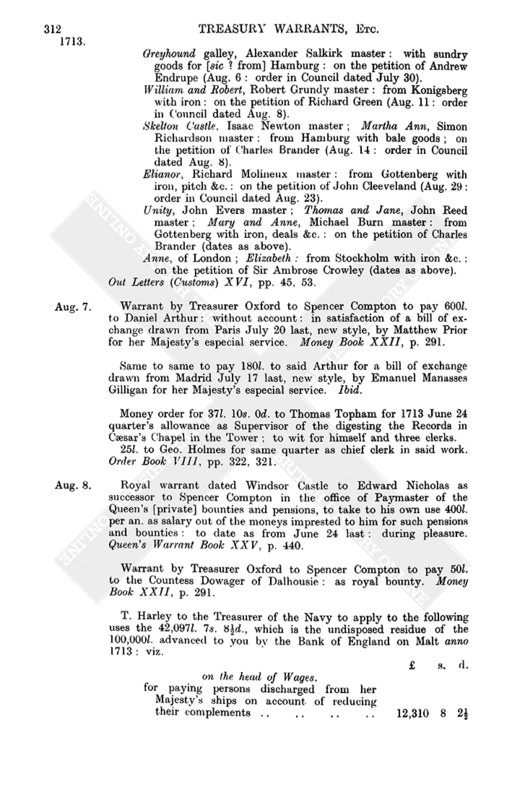 Warrant by Treasurer Oxford to the Barons of the Exchequer, Scotland, to pay the June 24 quarter's list, detailed, of the Queen's charities and bounties in Scotland: to a total of 500l. This list shows the following changes from the preceding quarter's list, supra, p. 198, under date May 1. The following names have disappeared, viz. Robert Myreton, Eliz. Fearme. Eliz. McKenzie, Anna Drummond, Barbara Nasmith, Barbara Cairncross; and the following names appear as new, viz. Eliz. Brown, 1l. ; Mrs. Elphinston, 1l. ; Mrs. McKewen, 1l. ; Mrs. Mary Dickson, 1l. ; Mrs. McClean, 1l. 5s. 0d. ; Margaret Jack, 1l. ; Anna Simpson, 1l. ; Sarah Greirson, 10s. ; Mr. Shaw, 10s. ; Mrs. Irvine, relict of an Episcopalian minister, 1l. ; Katharine Graham, 10s. ; Mrs. McKenzie, 10s. ; Thomas Moncreife's relict, 1l. ; the widow of Major Wachop, 1l. ; Margaret Norton, 1l. 2s. 6d. Out Letters (North Britain) II, pp. 442–7. Entry of Treasurer Oxford's signature of the docquet of a signature of grant to Katharine Monipenny, relict of George Moncreife of Sauchop, and to David Monipenny [the] Younger of Pitmillie, of the sixteen parts and 32 parts of the town and lands of Birehills (Byrehills) and 20 rigs and two acres of land of the Priory of St. Andrews lying within the Regality of St. Andrews and Sheriffdom of Fife upon the resignation of John Young, portioner of Birehills, and George Methoin, citizen in St. Andrews, “ whereby your Majesty of new disposes the said lands, riggs, acres and others above written by one clause of novodamus and confirms some of the rights and infeftments of the same.” Ibid., p. 448. Royal warrant dated Windsor Castle to the Clerk of the Signet for a privy seal for 2,000l. per an. to Hugh, Earl of Loudoun, as Keeper of the Seal appointed by the Union to be kept in place of the great seal of Scotland: as from 1713 Lady day during his continuance in said office. (Privy seal dated Aug. 27 hereon.) Ibid., pp. 448–9. Same to same for a same for 2,000l. to the Duke of Atholl as Keeper of the Privy Seal of Scotland: as from April 16 last (the date of his commission) during his continuance in said office. (Privy seal dated Aug. 31 hereon.) Ibid., pp.450–1. Money warrant for 104l. 2s. 2¼d. to Isabella Arundell for so much due from 1713 April 10 (when she was sworn and admitted a Woman of the Bedchamber) to June 24 following, on her annuity of 500l. per an. as such. (Money order dated Aug. 20 hereon.) Money Book XXII, p. 302. Order Book VIII, p. 324. William Lowndes to the Navy Commissioners to make out a Navy bill for impresting 3,134l. 13s. 3¼d. (being the sum warranted the 13th inst., ut supra, p. 318) to Francis Lynn, Cashier to the Commissioners for Sick and Hurt Seamen: upon account to pay the 6 per cent. interest on the sum of 69,659l. 3s. 10¼d., which was the debt of the said Office for Sick and Hurt Seamen on the 25th March 1711, to wit the interest thereon from 25 March 1711 to 25 Dec.1711, “computed according to the Act of Parliament [?10 Anne, c. 38] in that behalf: which said principal sum of 69,659l. 3s. 10¼d. hath already been transferred by the Treasurer of the Navy to the late Treasurer for Sick and Wounded Seamen without such interest.” Disposition Book XXII, p. 150. T. Harley to same to make out a Navy bill for paying 20,000l. to Sir Roger Mostyn, Paymaster of Marines, upon account of clearing what shall be due to the non-commissioned Officers and soldiers of the Marine Regiments ordered to be disbanded according to an Address of the House of Commons [24 June 1713, Commons Journals XVII, p. 440] in that behalf: to be charged on the loan from Sir William Fazakerly et al., as by the warrant of July 31 last, supra, p. 303. Ibid., p. 152. T. Harley to the Secretary at War enclosing for his consideration a letter [missing] received by Mr. Brydges from Col. Kane dated from Port Mahon 22 July last, old style; there being several matters therein which concern you to regulate and explain. Out Letters (General) XXI, p. 14. Same to the Taxes Commissioners enclosing for their consideration the reply [missing] of the Land Tax Commissioners in the Hundred of Seisdon, Co. Stafford, to my Lord Treasurer's letter about their arrears. Ibid. Same to the Comptrollers of Army Accounts. Mr. How has proposed the contracting for new clothes and accoutrements for the 12 Companies of Invalids, “their former having been wore above two years.” Please report on the proposed rates &c. for same and in what manner the charge thereof is to be defrayed, so as my Lord may be apprized whether it falls within any the sums voted for the public services of this year. Please also report on the demands of the officers of the late British Hospital in Portugal and of the Officers of the late Regiments of Brigadier Withers and Col. Labouchitire as in their enclosed memorials [missing]. In all your reports on money demands please represent to my Lord whether any provision is made by Parliament towards satisfying same and on what heads of the public expense they ought to be placed. You are also to consider in like manner Mr. Brydges’ memorial for 2,032l. 19s. 4d. for an allowance of forage to the six Battalions detached the last campaign from Flanders to Dunkirk. Ibid., p. 15. Same to the [Principal] Officers of the Mint to report on the enclosed petition [missing] of Charles Tunnah and William Dale proposing the coining of farthings and halfpence of a new metal that toucheth like gold. Please bring your report “when you are prepared to lay your thoughts before his Lordship about coining farthings and halfpence in the method discoursed of when you last attended here.” I also enclose for your consideration a memorial and certificate [missing] on behalf of Catesby Odam, who prays the office of assaymaster. Ibid. Treasury reference to the Victualling Commissioners of the petition of Jeremiah Kelly, brewer at Deal, shewing that when he was prosecuted for buying beer of [ships’] pursers he laid his practice and case before my Lord Treasurer; that there being at that time a large sum due to Kelly in the Victualling Office the same has been detained from him ever since to his exceeding detriment, and unless relieved will be the ruin of his trade and family: therefore praying to have the bills which belong to him delivered from the Victualling Office. Reference Book IX, p. 136. 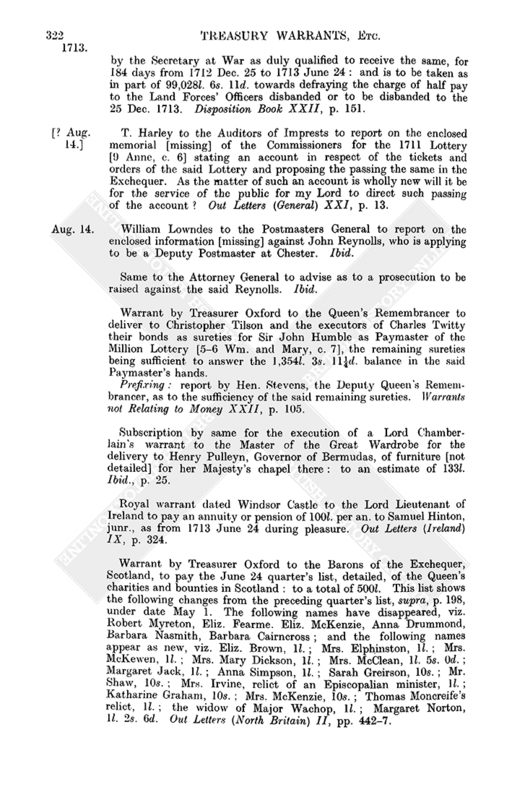 Royal warrant dated Windsor Castle to the Lord Lieutenant of Ireland to pay to Cols. Charles Churchill and Harry Goring what shall be due to their Regiments for 128 days from March 25 last to July 31 inst., notwithstanding their being in England during that time: they having been placed on the Establishment of Ireland as from March 25 last, but having been detained in England. Out Letters (Ireland) IX, p. 323.